Here at Seapoint Clinic, we have a dedicated Teeth Whitening Suite, allowing you to get a beautiful bright smile at a time that is convenient for you. Sit back and relax while the whitening gel and light get to work for you, as you watch a movie from our vast library. You won’t find a more relaxing and pleasant way to get your teeth sparkling. Seapoint's Deep Teeth Whitening is the fastest way to get your teeth as white as they can be. You may have seen the results firsthand on TV3’s Ireland AM when we performed the whitening, live with dramatic results. Here at Seapoint Clinic, we have a dedicated Teeth Whitening Suite, ensuring you can get beautiful white teeth at a time that is convenient for you. 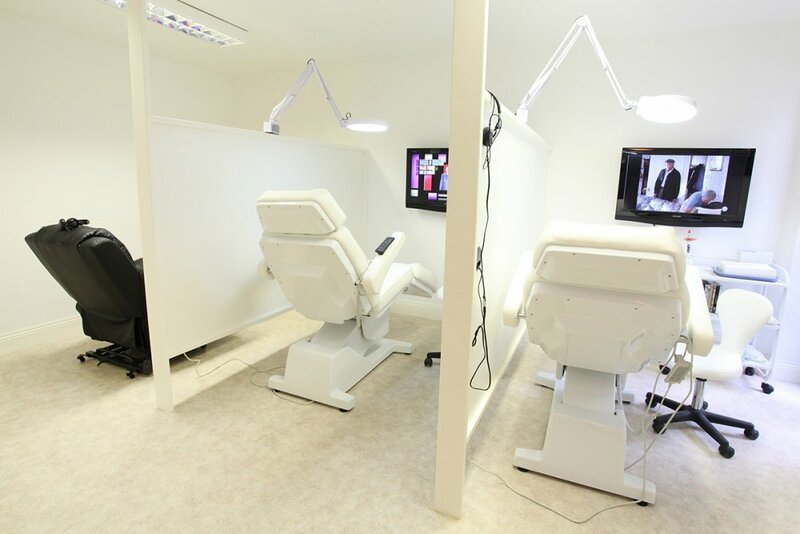 Choose a film from our DVD library, then lie back and relax while the whitening gel and light get to work for you. You won’t find a more relaxing and pleasant way to get your teeth sparkling. Seapoint's Deep Teeth Whitening is often performed for people who have sensitive teeth and cannot wear trays for home whitening. Some, but not all patients will experience sensitivity after whitening. Usually this will only occur towards the end of your whitening session when the benefits have been achieved. Some people may experience sensitivity in the hours after whitening, and using Sensodyne® toothpaste on your teeth can help alleviate this. Most people do not need any painkillers for this but if you are anxious at all about the procedure, you may consider taking some gentle painkillers before your appointment. How dramatic will my result be? There is a limit to how white your teeth will naturally go. Seapoint's Deep Teeth Whitening will get your teeth as white as they can be without opting for porcelain veneers. Usually, your teeth can lighten by nine to twelve shades in one 45 minute session. This level of whiteness will vary from person to person. This depends on any habits you may have such as smoking, drinking red wine or eating staining foods. The less of these you consume, the longer the effects will last. Generally, you can expect 1-3 years. If you do smoke, we would recommend getting home whitening trays for top-ups when needed- Regular hygiene appointments can also help maintain your brightness. I can't believe how bright my teeth are after just 90 minutes! I'm delighted with the outcome! Please go to our pricing page for more information on our current prices. We are very competitive for all treatments especially for whitening. To keep updated of all whitening offers please “Like” us on Facebook and we will keep you updated on any special upcoming offers. Who may benefit from Seapoint's Deep Teeth Whitening? Almost everyone sees the immediate effects of a treatment. However, teeth whitening may be more effective on some that it is on others. We can determine if you are a viable candidate for Teeth Whitening through a thorough quick exam in our whitening suite, including a teeth shade assessment. This consultation is free of charge and can be done on the same day as whitening. Whitening is one of the most popular cosmetic dentistry procedures that people are considering nowadays. A bright, sparkling smile can make a huge difference for everyone and is a real treat before a special occasion as it brightens up the face instantly. The Teeth Whitening System makes it easier and faster than ever before and is taken home, where you can top up as necessary. Yes, completely. Extensive research and clinical studies indicate that whitening teeth is safe. In fact, many dentists consider teeth whitening the safest cosmetic dental procedure available. As with any teeth whitening product, Teeth Whitening is not usually performed on anyone under 18 years of age, and is not recommended for pregnant or lactating women. In certain circumstances teeth whitening can be performed on children over the age of 13 for discoloured teeth. Your dentist will decide if whitening is needed. Is there any difference between over-the-counter teeth whiteners and Seapoint's Deep Teeth Whitening? Yes. Consulting your dental professional is always the first step to whitening your teeth safely. Plus, over-the-counter teeth whitening strips, brush-on gels and toothpastes take weeks or months to whiten your teeth just a few shades. In-clinic whitening is clinically proven to whiten your teeth nine to twelve shades in 45 minutes. How does the Seapoint Deep Teeth Whitening System work? The light-activated teeth whitening gel’s active ingredient is Hydrogen Peroxide. As the Hydrogen Peroxide gel is broken down, oxygen enters the enamel and dentin, bleaching coloured substances while the structure of the teeth is unchanged. The Teeth Whitening light aids in activating the hydrogen peroxide and helps it penetrate the surface of the teeth. The only side effect that some people experience is temporary increased teeth sensitivity to cold. These symptoms disappear within 1-3 days after completion of the teeth whitening treatment. How is exposure to the Seapoint Teeth Whitening light controlled? The Teeth Whitening procedure requires that all soft tissue in and around the mouth be protected. The area is monitored during the procedure to ensure any exposed skin or tissue is isolated and protected. Protective eyewear is required during the procedure. Light sensitive individuals including those undergoing PUVA (Psoralen+UV Radiation) therapy or other photo-chemotherapy, as well as patients with melanoma, should not undergo the Teeth Whitening procedure. Also patients taking light sensitive drugs or substances should consult their physician prior to considering Teeth Whitening. 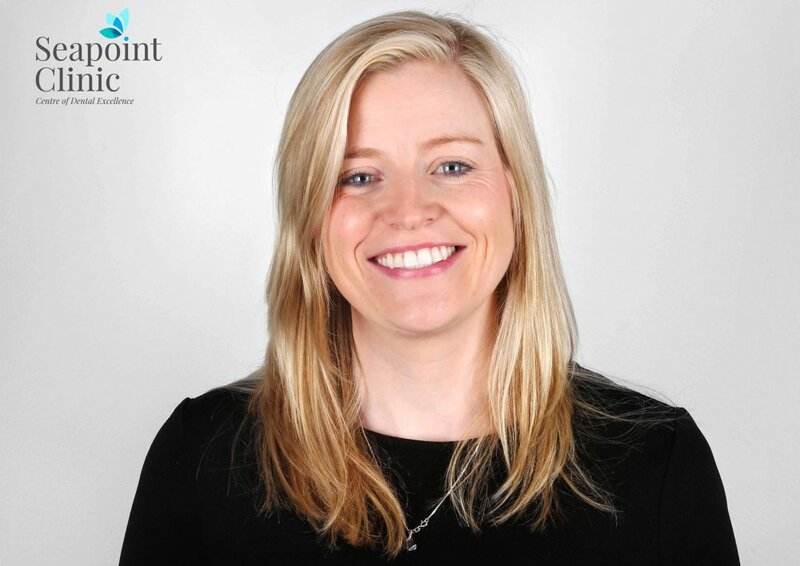 How long does Seapoint Teeth Whitening take? The complete teeth whitening procedure takes just over an hour and a half (Two hours if you would like to also include home whitening trays). The teeth whitening begins with a preparation period followed by 45 minutes of whitening. This is done in 3 sessions of 15 minutes. A hygiene appointment is recommended prior to the actual Teeth Whitening session. How does tray whitening compare? Tray whitening is a great and inexpensive way to whiten your teeth. It is often combined with Seapoint's Deep Teeth Whitening so you can achieve instant results and you will still have the whitening trays to use later to “top up” your teeth safely and effectively if you feel they have stained after time or after foods which are particularly strong in colour. Can I just get a tray system over the counter? You cannot buy teeth whitening gels of the same strength and quality from a chemist as you can from your dentist. Moreover, the tray made by your dentist is custom made and fits your teeth like a personal retainer. A tray you make yourself from a kit may leak gel into your mouth and allow saliva into the gel reducing its effectiveness and can even damage your gums.